There are only a few thousand tigers left in the wild. The animals are on the critically endangered list - one step away from extinction. WASHINGTON – There are only a few thousand tigers left in the wild – one step away from extinction. The animals are on the critically endangered list, which is why the National Zoo was celebrating Global Tiger Day on Saturday. This global effort to save the majestic animals is celebrated worldwide. The goal is to raise awareness about the tiger crisis and to gain support for tiger conservation. Devin Murphy, a communications specialist with the Smithsonian National Zoo, says there are two major reasons for the tiger’s decline: loss of habitat and poaching. “If we don’t do anything soon, it might be too late,” Murphy says. 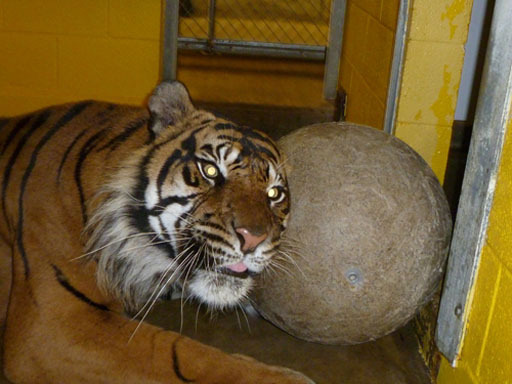 Kavi, an 11-year-old Sumatran tiger, is one of the zoo’s new additions to their great cat family. He has only been at the National Zoo for about two months. Kavi was one of the headliners for Global Tiger Day. He spent Saturday morning hanging out in his new yard at the zoo. He was checking out visitors as they struggled to spot him, since he was tucked away and blended into the brush. The big cat has two jobs at the zoo. She says there are only 500 to 600 Sumatran tigers left in the world, so they hope to breed Kavi with one of the zoo’s youngest females. The zoo only has three Sumatran tigers right now. Kavi came from Zoo Atlanta as part of a breeding program. Magnuson says if all goes well with the female tiger, Damai, there could be cubs as soon as May of next year.